In Book XI of the Confessions, Augustine meditates on the eternality of God and his relation to time. He answers skeptics who scornfully ask: What did God do before the creation of the word? Augustine’s answer is that God is eternal. He created time and is not within it. Every moment in time is equally accessible to him. They endeavor to comprehend eternal things, but their heart still flies about in the past and future motions of created things, and is still unstable. They would see that a long time does not become long, except from the many separate events that occur in its passage, which cannot be simultaneous. In the Eternal, on the other hand, nothing passes away, but the whole is simultaneously present…. Who will hold the heart of man that it may stand still and see how the eternity which always stands still is itself neither future nor past but expresses itself in the times that are future and past? As for the skeptic who scornfully asks, “What was God doing before he made heaven and earth?” Augustine suggests one might answer: “He was preparing hell … for those who pry too deep.”! For thou madest that very time itself, and periods could not pass by before thou madest the whole temporal procession. But if there was no time before heaven and earth, how, then, can it be asked, “What wast thou doing then?” For there was no “then” when there was no time…. 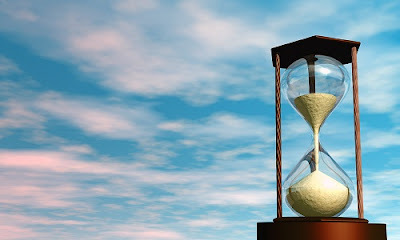 In the eminence of thy ever-present eternity, thou precedest all times past, and extendest beyond all future times, for they are still to come—and when they have come, they will be past…. Thy years neither go nor come; but ours both go and come in order that all separate moments may come to pass…. Thy “today” is eternity…. Thou madest all time and before all times thou art, and there was never a time when there was not time. There was no time, therefore, when thou hadst not made anything, because thou hadst made time itself. And there are not times coeternal with thee, because thou dost abide forever…. I've dealt with a similar question. Someone will ascertain that I'm a believer, then ask if the Lord is all-powerful, meaning omnipotent. When I affirm that, yes, He is, the follow up question is, "Can God make a rock so large that He can't lift it?" Of course he can. He's God. Then they'll argue that God isn't all powerful, because He can't lift the rock He made. My reply? "He's God. He is a completely, truly sui generis being, and is omnipotent. He can simultaneously create a rock so heavy that He cannot lift it, and lift that rock as if it weighed nothing. He can do this, and more. Were he not God, he couldn't do this. But He is, so He can." I never gave much thought as to what God might have been doing before He decided to create the known universe, but I suppose He did as He saw fit. MJ, thanks for the comment. Interesting that Augustine is defending a "classical" view of God as eternal, immutable, omnipotent, and, as you point out, this is still under attack from skeptics and even, sometimes, from those within the church. I'm reading a new book by James Dolezal titled "All That Is In God," which defends a classical, confessional view of God, particularly with regard to God's immutability, over against what he calls "soft mutualists." Though brief, it is also somewhat technical, but you might find it interesting. I'll eventually write a review of it. Anyhow, good to get your feedback and encouragement. Hope all is well for you. Blessings. The Vision (1.19.18): Lord, to whom shall we go?